This is part two of a three-part series. Read part one if you haven’t already. 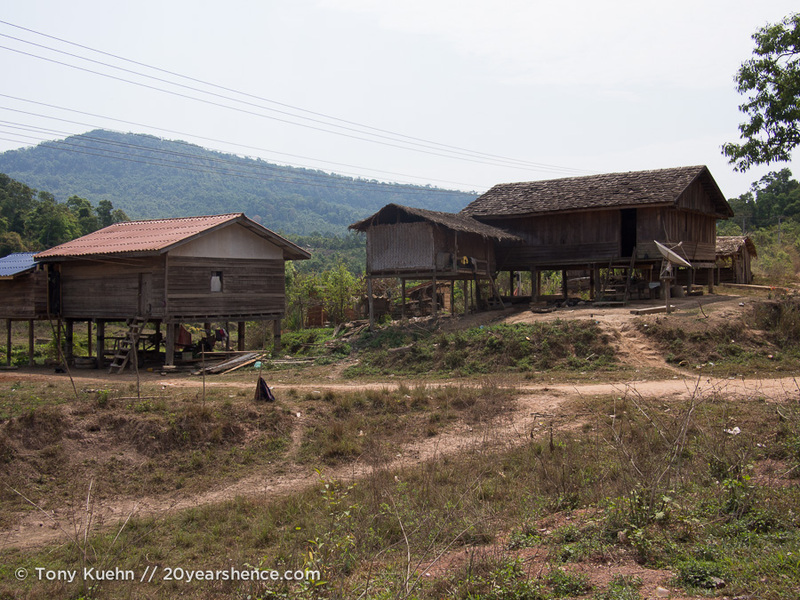 It was the second morning of our journey around the Thakhek Loop. The sun was barely up, my belly was full of delicious mini French toasts (how something so delightful could be prepared by our most definitely not-delightful hostess remains a mystery) and the road was calling. Thanks to our relaxing surroundings, we were decidedly hesitant to answer, however we worked up the strength to tear ourselves out of the hammock one last time and ventured out onto the dusty road heading north. The majority of our second day on the Loop was spent slowly negotiating the dusty remains of the road, avoiding potholes, big rocks, washouts and choking on dust. The first 30 kilometers or so of the road was probably the best stretch, with the biggest hazards being clouds of dust and patches of loose rock. This was also the stretch with the most active construction, so it made us think (foolishly) that perhaps the road wouldn’t get any worse. Of course, we were soon proven wrong; as soon as the construction ended the road rapidly deteriorated, becoming little more than a rutted dirt and stone track through the jungle. The size and consistency of the road did eventually improve, but the real bane of the last 35 kilometers of the treacherous portion of the day’s ride was the washboard-like surface of the road. Despite looking smooth enough, the road was covered in tiny ridges and scattered stones, necessitating that we keep our speed below 30kph, lest we be vibrated to bits. Every 30 minutes or so we would have to pull over, stretch, and give our tired hands a break. The vibration was so severe that after prolonged exposure our hands would begin to itch uncontrollably, our poor, confused nerves unsure of what was happening, and responding the only way they knew how. To add insult to injury, the scenery along the unpaved portion of the Loop was not as good as what had come before. There were a few nice vistas and a slightly interesting stop here and there, but mostly we just had to grit our teeth and get on with it, feeling the minutes and hours stretch out in front of us as the sun rose in the sky. 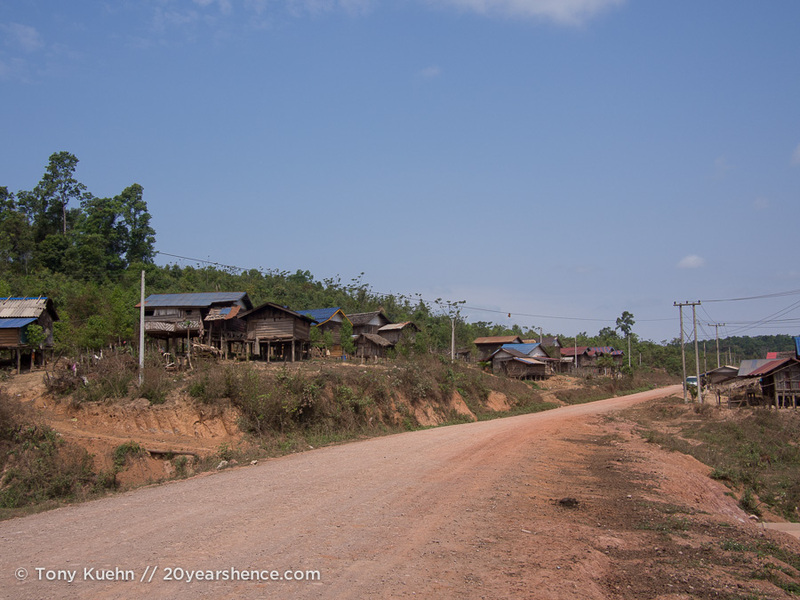 After a period of time less than a hundred years but more than two and a half hours, we finally spotted the tiny town of Lak Sao, the end of our dusty death march. By this point the day was swiftly getting away from us, but after the interminable wasteland we had just ridden through, we decided lunch was essential. After a brief stop at a very friendly (and delicious) vegetarian pick-and-mix, we were back on the road once more. 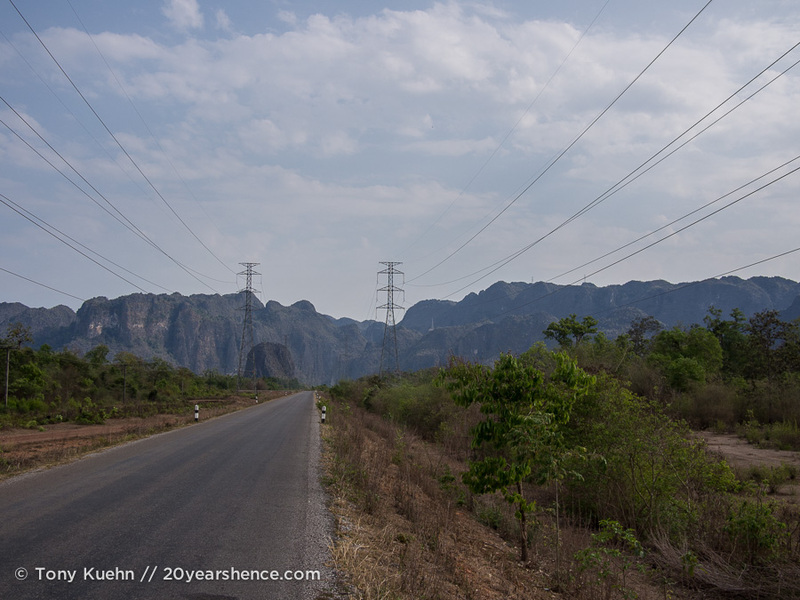 Following the preceding 60 kilometers of vibration-induced double vision, the road west of Lak Sao was like riding on polished glass. 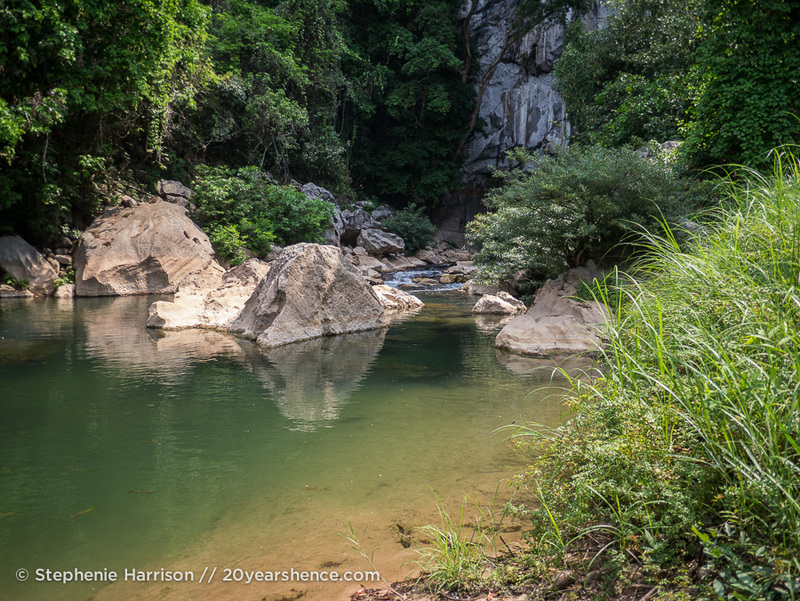 The scenery improved as the road gracefully slithered around low hills and through valleys, greatly elevating our mood and getting us excited for our last stop on the Loop: Kong Lor Cave. However, before we could get to the cave we had to first go through a little town called Nahin, which we reached at what seemed like light speed after the toil of the morning. The heat of the afternoon seemed to have a palpable weight as we slid off our bikes in front of the tourist information building, hopeful we might find out about some accommodation in the area. Inside the building, the staff was uniformly unconscious, afternoon drowsiness easily besting their desire to tell curious visitors about the area. 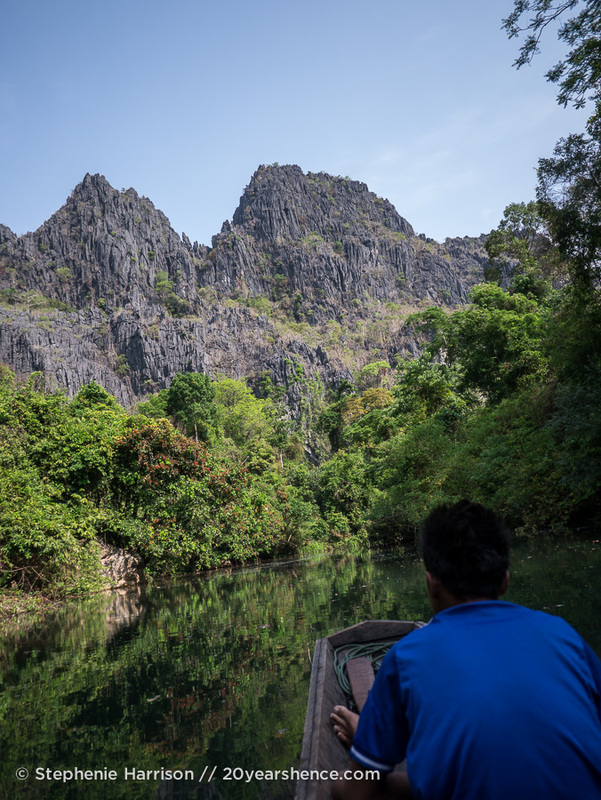 Eventually one of the girls woke long enough to blearily stare at us as we fiddled with maps and tried to figure out where we were in relation to Kong Lor Cave and if Nahin had guesthouses. She mostly ignored us and halfheartedly poked at the phone with no clear goal, the somnambulant look on her face making it clear that we wouldn’t interrupt her nap for much longer. Back outside in the heat, we were no closer to knowing exactly where we needed to go, and after some heat-induced light bickering, we decided to keep moving. We hadn’t seen a single guesthouse or restaurant as we rolled into/through Nahin, so despite not wanting to keep going so late in the day, we decided to ride the remaining 40ish kilometers between us and the cave and see what happened. What happened was this: despite riding farther, we ended up not riding far enough. 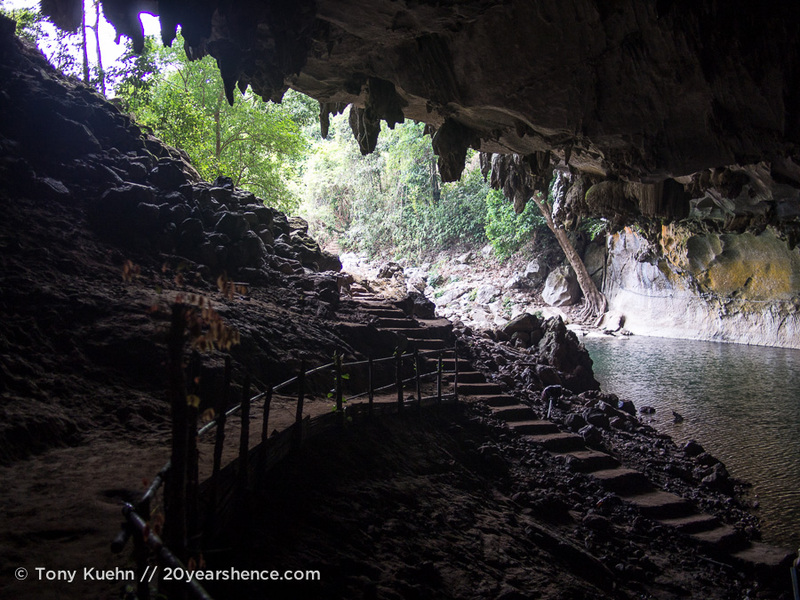 Kong Lor Cave is at the end of a 40km stretch of road, a stretch of road that, as it happens, has absolutely nothing on it for nearly its entire length. After a while we saw a couple of guesthouses, but had heard that there might be a few closer to the cave, so we rode on (Lonely Planet was so wrong here it’s laughable—distances, prices, names, all of it). We were 4km before the end of the road before, having seen nothing of interest, we turned around and went back. As it happens, there is a glut of perfectly acceptable guesthouses just 1km before the end of the road, which we discovered the next morning. Oy. In any case, the little guesthouse we found was just fine, and fairly cheap to boot. 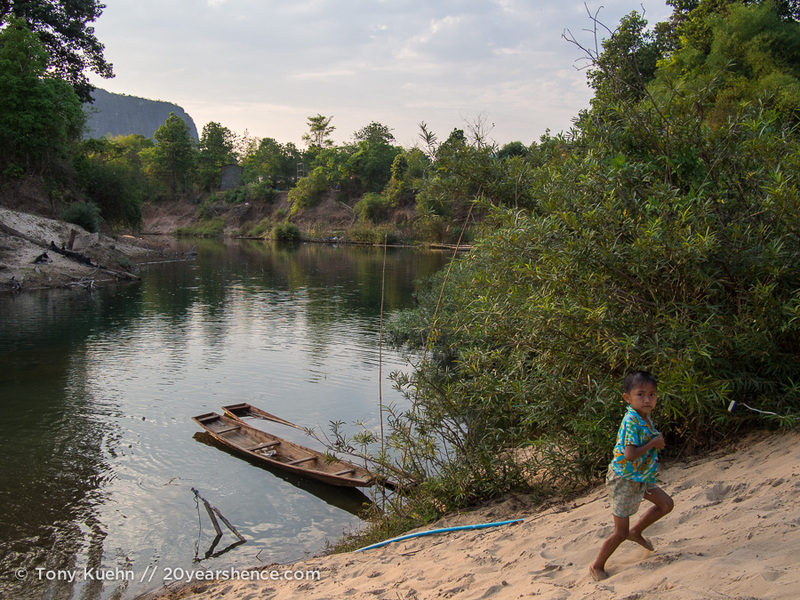 A scenic river ran behind the little bungalows of our guesthouse, and a bend in the river’s flow made massive piles of soft sand that were popular with the kids and dogs of the area. Our room was nice enough, with the exception of an unreasonably large spider hiding under a towel, which managed to escape into my jacket (!! ), survived a thorough beating with a flip-flop and then scurried under the bed and into our nightmares forever. We briefly considered burning the place down, but decided on having a meal instead. After a game of improvised street rules, no-racquet hand-tennis with the local kids while our food cooked, followed by a chewy (but tasty) dinner, we finally settled in for the night. The next morning we were gently roused from our slumber by the insane barking of a tiny, demonic dog suffering the slow loss of its confused mind. It was time to go to the cave, if for nothing else, to escape the dog. 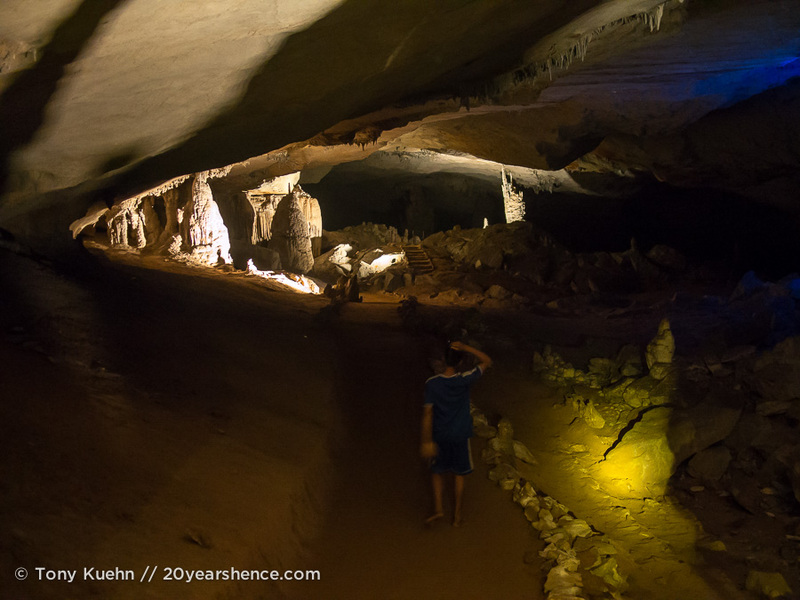 For many, Kong Lor Cave constitutes the highlight of the loop, and possibly their entire time in southern/central Laos. 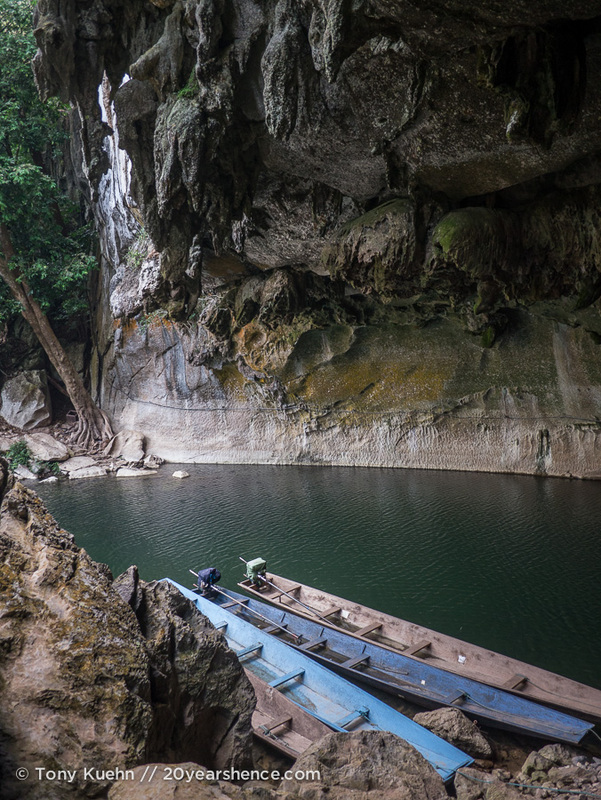 Considered a natural wonder, Kong Lor draws tourists from all over southern and central Laos, and for good reason: it’s massive and very impressive. The cave’s deserved popularity was yet another reason we decided to press on the day before, hoping that we would find a reasonable guesthouse close to the cave that would allow us to get there before the crowds, without enduring a 40+ kilometer drive in the wee hours of the morning. 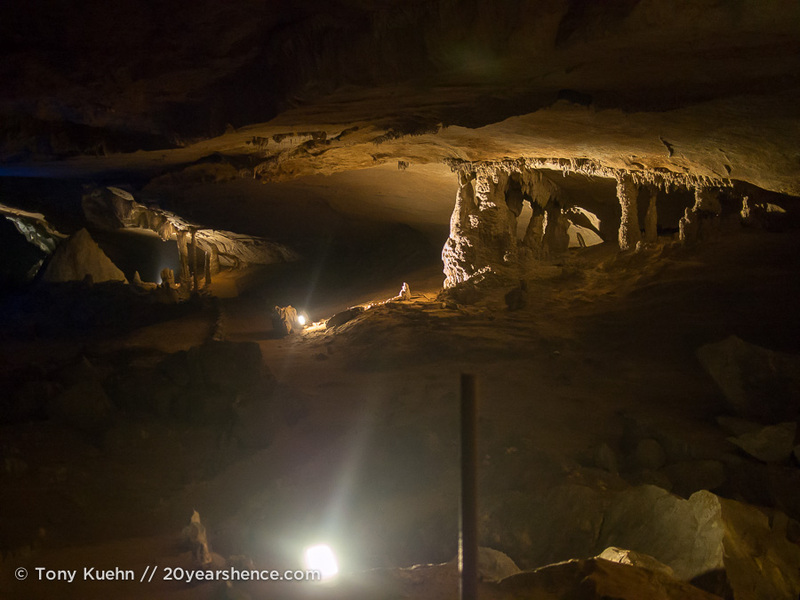 As it turned out, our plan worked to perfection, and we were able to leave our room key with the spider and depart a mere five minutes before the cave complex opened. The park was very quiet, but not so much so that we weren’t able to find a third person to share a boat with, saving us some money and making a friend for the morning. Soon enough we were headed through the unassuming entrance to the cave and into the darkness beyond. 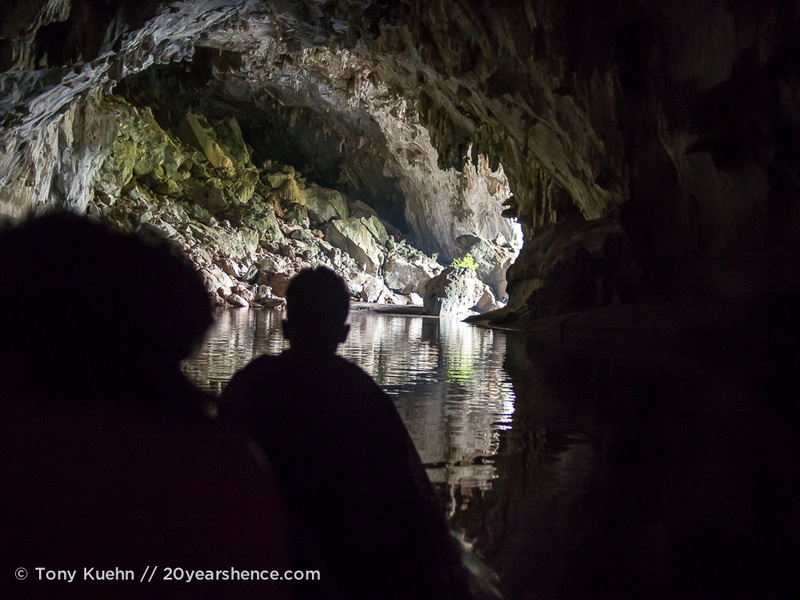 Kong Lor is nearly 8km long, a journey done almost entirely by boat, and mostly in darkness. 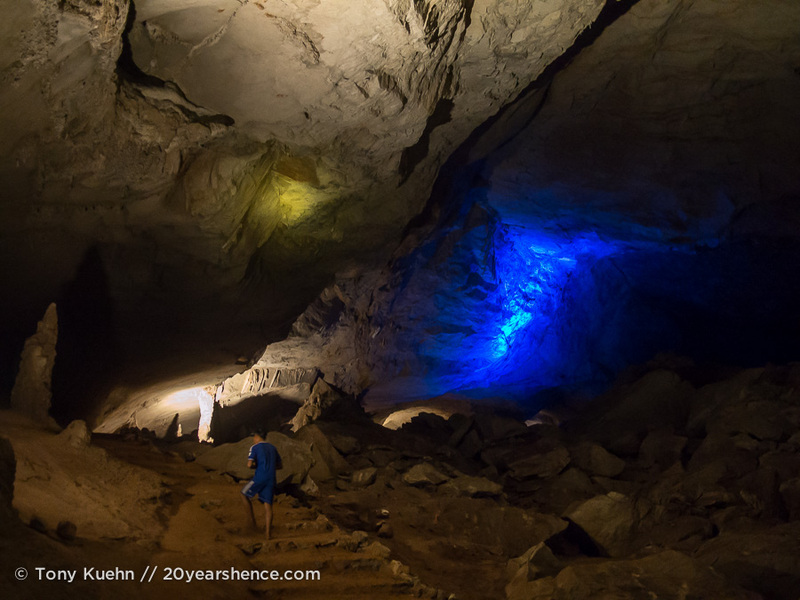 Only a small stretch is traversed by foot, and as it happens, this is also the only portion of the cave that has lights. 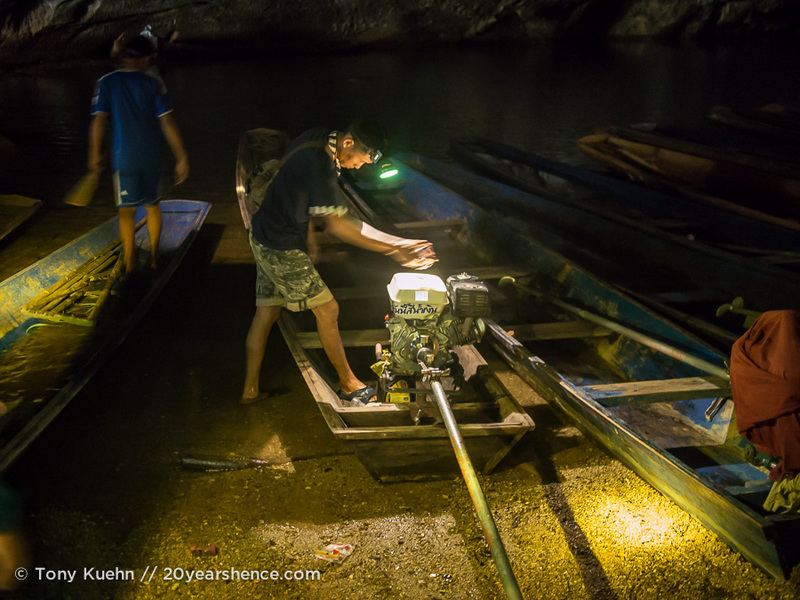 The rest of our ride was spent sitting in our long, narrow canoe listening to the whir of the small motor and feeling the rush of the air on our faces, the only light coming from the erratic illumination of our headlamps. Kong Lor was simply amazing. 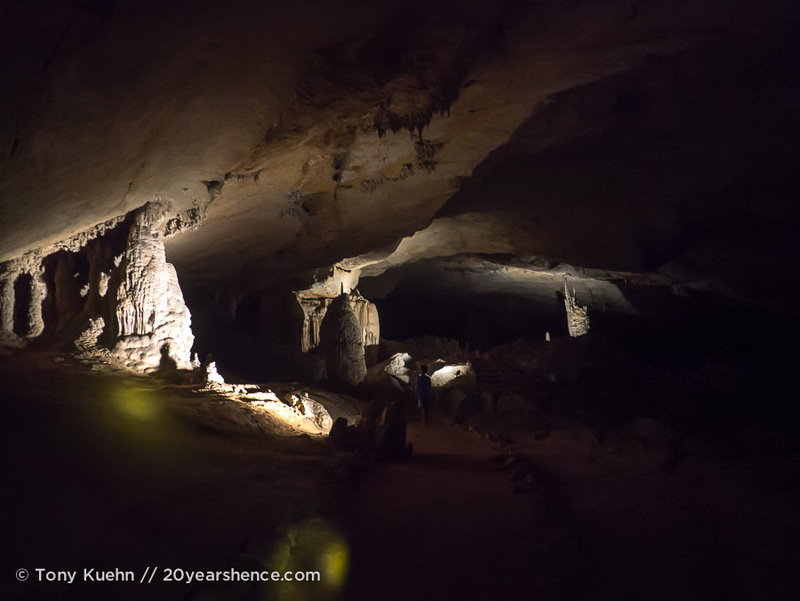 Some of the caverns were so large our headlamps didn’t light the far end and some rooms had ceilings over 100 meters high. It was hard to say how fast our little skiff was moving, but judging by the noise of the water and the force of the wind, it wasn’t slow. And yet the cave seemed to go on and on, the shroud of its total darkness unwilling to reveal all its secrets to our prying eyes. The sense of rushing through some vast, dark space from the unknown into the unknown was exhilarating and I never wanted it to end. 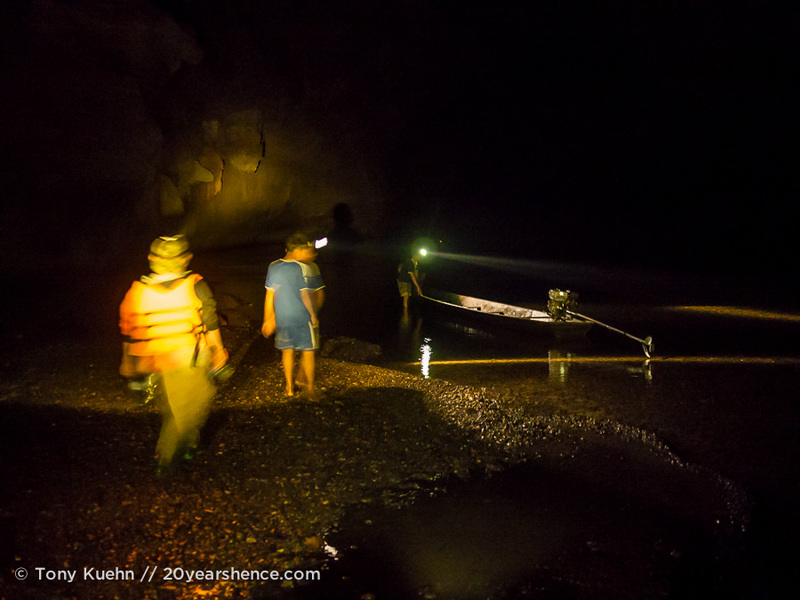 Our captain unerringly piloted the unwieldy boat around curves and past random outcrops of rock with little more than his own headlamp and infrequent reflective markers. We climbed rapids and scraped bottom, we whistled by invisible walls of rock and gasped as the ceiling, out of view moments before, suddenly appeared a meter above our heads. Near the exit we had to scurry out of the boat and haul it up some small rapids and into the shallows, all of us heaving together as the craft rasped its way across the rocks. After nearly an hour of darkness, we slid out into the dazzling morning light and headed for a small clearing near the cave’s exit. 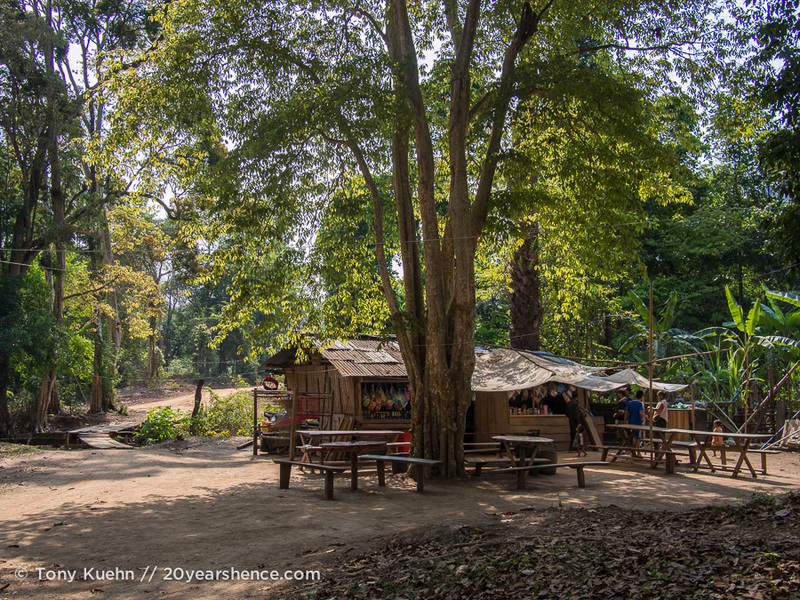 Like so much of Laos, the clearing was full of hopeful vendors and sleepy dogs, and our captain indicated we would be spending an arbitrary amount of time here before heading back. We milled around, avoiding the gaze of the vendors until enough time had passed and then headed back to the boat. To our surprise (and my delight), our return journey was back through the cave, giving me a chance to enjoy the scenery in reverse. 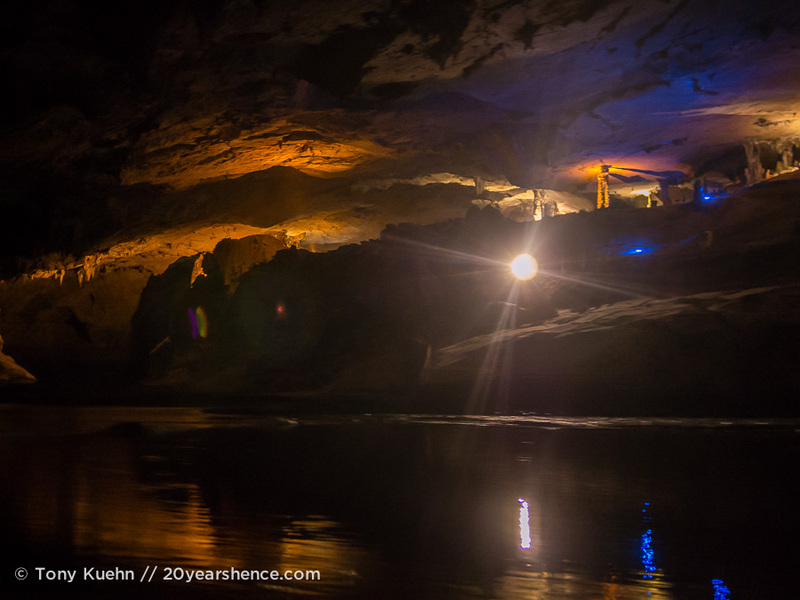 This time we merrily (or horrifyingly, depending upon your proclivities) skipped down rapids, shooting through gaps like a cork from a bottle, our theme song the insane cackle of the boatman as we splashed downriver, pinballing our way out of the cave. As with anything enjoyable, it was over too quickly, and our time in Kong Lor had come to an end. After collecting our things we stumbled back to the motorbikes, the glare of the sun still overwhelming our recently adjusted eyes. The cave was a great experience, and combined with the scenery we had ridden by in the last two days, it felt like a very worthwhile journey indeed. 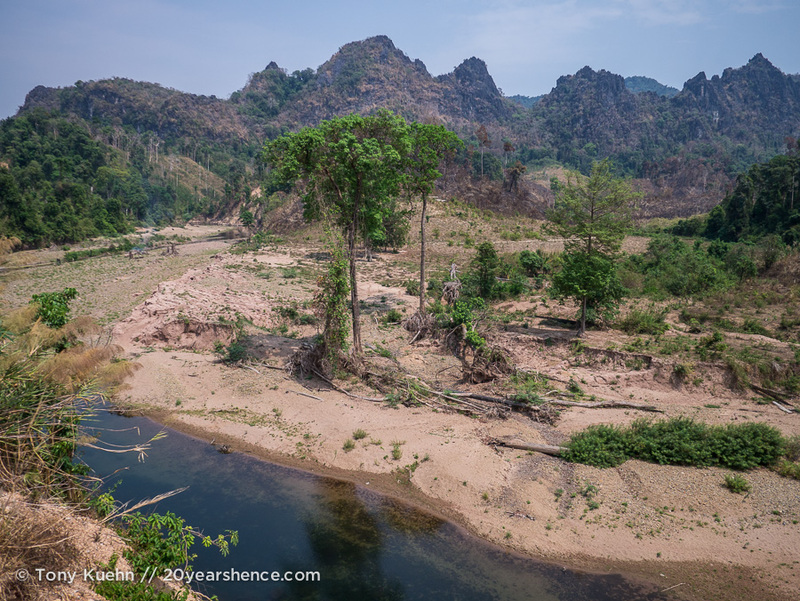 All that remained was the 40km back to Nahin and then the 115km from there to Thakhek. 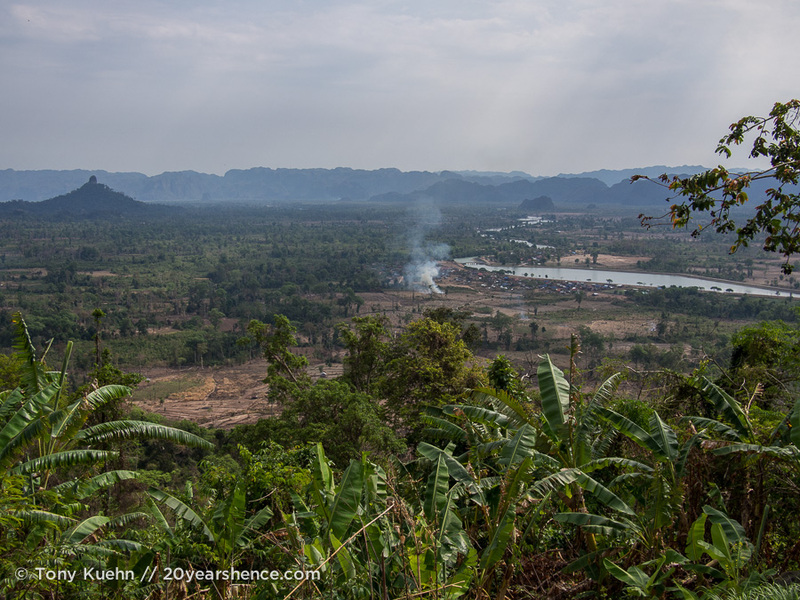 Unfortunately, barring a very nice viewpoint 2km after the turnoff for Kong Lor, we did absolutely nothing worth writing about on the ride back to Thakhek, beyond the stultifying boredom of it all. We both agree that, if not for the construction, it would have been vastly preferable to simply ride the Loop back the way we had come. In retrospect, if we had a bike better suited to the rough road I would do just that and, much like the cave, happily enjoy the scenery in reverse. 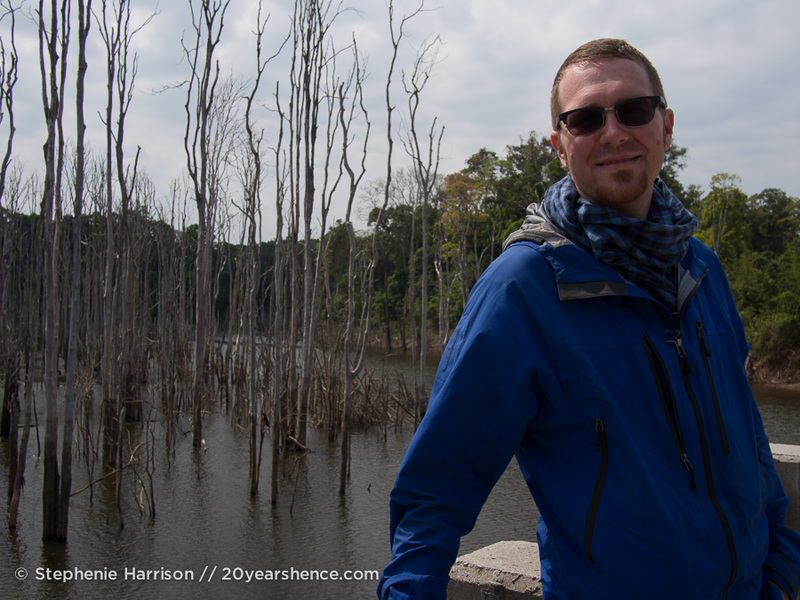 That’s not to say that there is literally nothing to see on the way down to Thakhek — the Blue Lagoon is on that side of the Loop. We did consider stopping at the Blue Lagoon on our way back, but we ultimately decided it was just too late in the day to make such a significant side trip, especially considering the obviously poor condition of the road to the Lagoon and that we had no idea if there would be anywhere to stay if it became too late to make it back to Thakhek in the same day. We did hear (after the fact) that it was very nice (no word on lodging), but by then we just couldn’t be bothered. Sad, but true. So, after 489km of Loop, what’s my bottom line concerning the journey? It was great! As I’ve said, I love a motorcycle ride, and the more time I’m on the bike the happier I am. We’ve done some pretty spectacular rides in Asia, and while this wasn’t at the very top of the list, it was still very good, even by my thoroughly jaded standards. If you’re a new rider that loves motorcycles and good scenery but hates Asian traffic, the Loop is ideal. It’s never very challenging, is almost always quiet and, mostly, the roads are very good. The parts that aren’t great are eminently navigable, just take them “slowly, slowly” (as they say here) and there will be little to worry about. I can say that, had it been wet season, certain sections of the road would probably be essentially impassable for someone on anything less than a proper dirt bike, but in dry season nearly anything on two wheels can make the ride without much trouble. So go and take the leap! Have fun, be careful, and do it right: do it on two wheels! This is part two of a three-part series. Read part one if you haven’t already. Stay tuned for part three: my tips and tricks regarding finding the right bike, riding safely and happily, and all the information I can fit into one post concerning Loop specifics for your journey, plus super bonus photos! They were pretty nice even if we only saw about 1% of the total caves on offer. 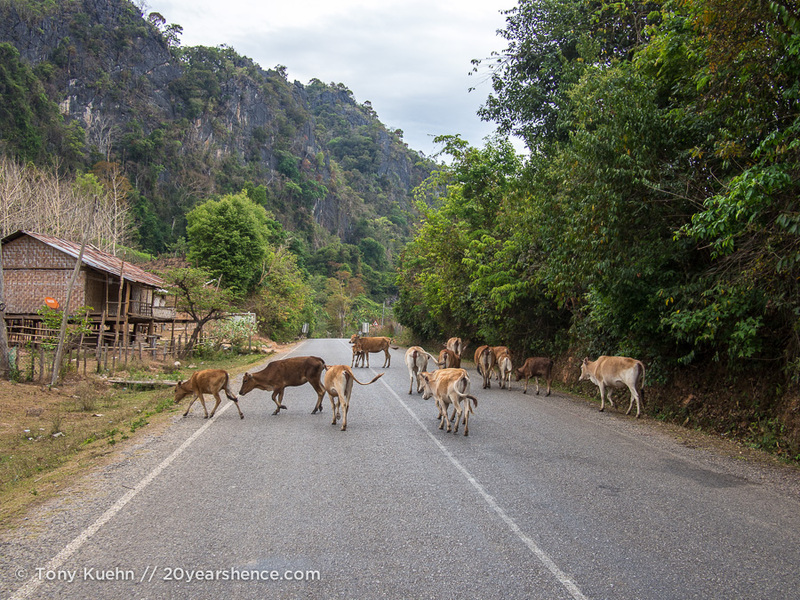 We actually found roads in Laos to be just fine for the most part. The construction zone was pretty bad, but overall the roads were no worse than northern Vietnam, the Philippines, Cambodia or anywhere else we’ve been so far. They were better than Nepal by a wide margin. Fortunately, since they were so quiet we didn’t choke on too much dust! Sometimes I wish I or Dale could drive a motorbike but neither of us never had a go, that’s why we didn’t venture with one while we were in Asia, we thought it wasn’t the best and safer place to learn. I know we missed out a lot, and the loop trip sounds amazing (even though I remember Laos being so incredibly dusty everywhere) but being so clumsy I thought I’d be sensible and don’t take risks. 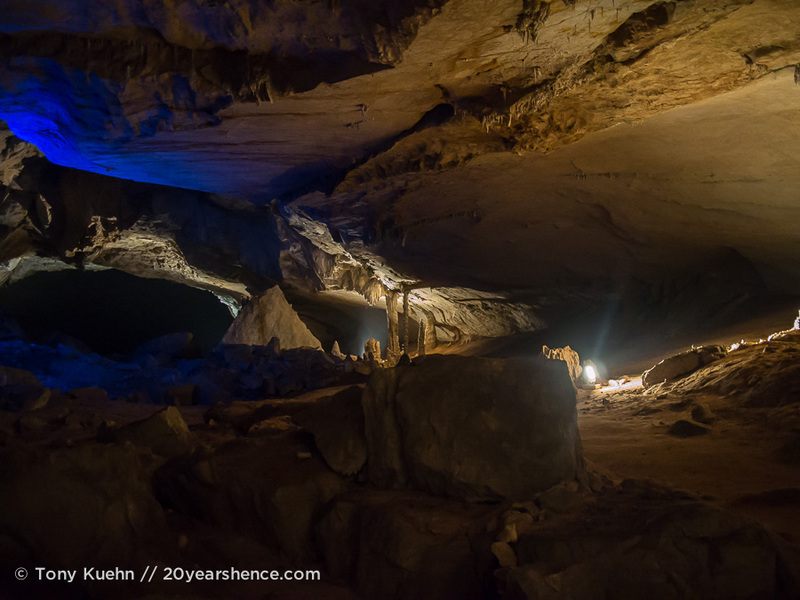 Those caves look stunning, lovely pictures as usual Tony! Thanks Franca! 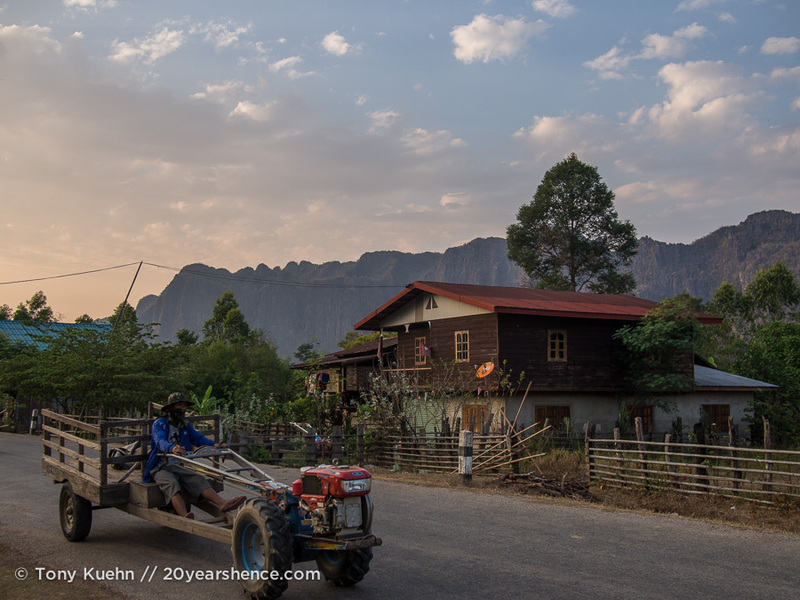 It’s true that Asia is not really the best place to learn to ride, but if I had to choose a country to learn in, it would be Laos. The roads are so quiet and the drivers are generally some of the best (by best I mean slowest and most courteous). Maybe one day when we meet up again I can teach the two of you to ride somewhere safe and then you can go out and have some new adventures! Very cool guys! And I’m lolling at the visual image of you guys handing your room key to the spider, hehe. Thanks! Yeah, the spider was pretty nasty. One of those things where you see it and you’re like, well, this is your room now, I’ll just go burn everything I own and leave the key with you. 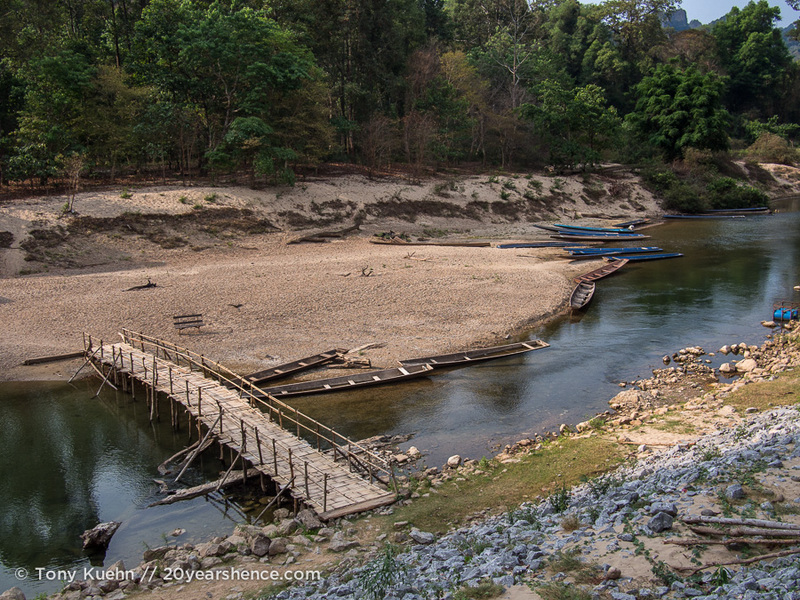 Really great set of posts about the loop – its definitely going on our list of possibilities for when we visit Laos. What are your favorite rides that you’ve done around Asia? Anaïs and I are beginners but we really enjoy this method of transport and are looking for a good adventure for beginners. Glad to hear that you’ll consider it! This is definitely the best ride for beginners we’re encountered so far, so if you do nothing else, try to make this ride happen. I can’t honestly say we’ve done too many other rides that I would recommend for beginners — I’ve been riding for almost 20 years now and have logged probably 10,000 km by now in SE Asia, so my perspective is a bit warped — but mostly traffic is just too chaotic for someone who isn’t already a confident rider. That said, Laos is the place if you want to build confidence, it is VERY quiet. 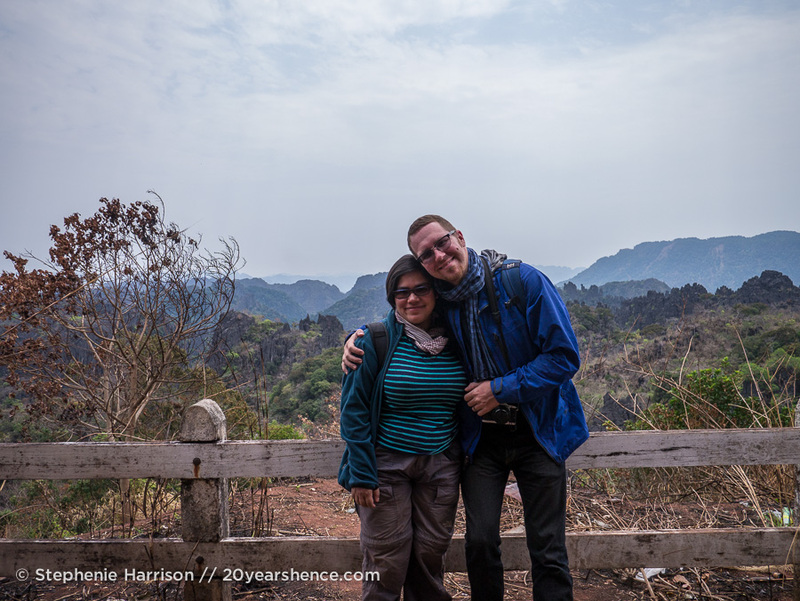 Some of our favorite rides include our first time in Vietnam, we rode a little motorcycle from Hanoi all through the north (all the way to the Chinese border) and then down to Ho Chi Minh City. We also rode a motorcycle across Flores in Indonesia, and parts of that ride were really great, though a lot of other parts were not. Riding around Bali was generally nice too, once we escaped some of the traffic. You can’t go wrong with a motorcycle in the Philippines, there is no end of places to discover on two wheels there. We took a big bike out of Chiang Mai to Pai, and that was a joy. Fun road (not for beginners! ), great scenery, and wonderful weather. Wonderful photos! I can almost taste that red dust, smell those pretty golden cows and jump into that limpid water. Thanks! There were certainly some really beautiful areas on the loop! Well worth it! I’m glad we could make the experience so vivid for you! Ah when I read about that spider…I know that I would be freaking out! 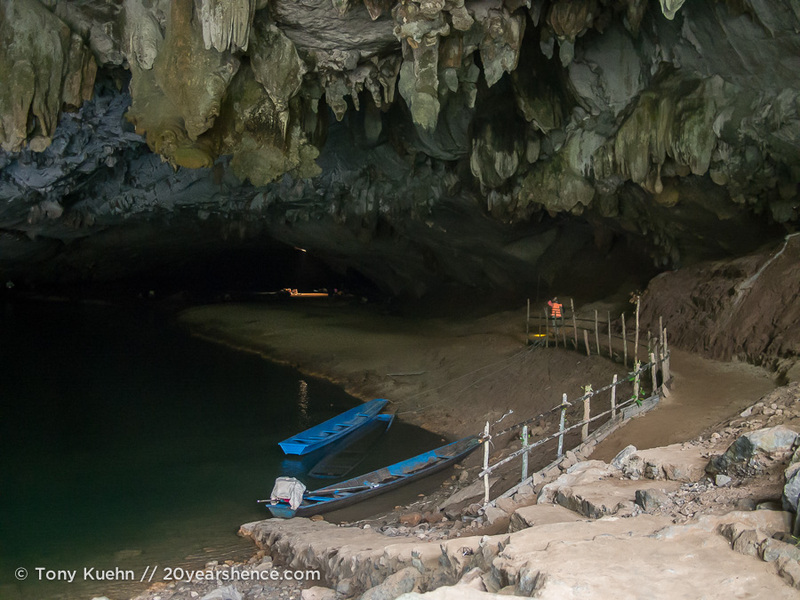 Going to those caves sounds like such a magical experience, especially since you are traveling mostly by boat! I would love to do this someday. It definitely makes the bumpy motorcycle ride worth it! And yes, for the guidebooks that are totally inaccurate, we are thankful to have blogs like yours to find out the real info!!! Lauren recently posted..Caribbean Cruise – Disembarkation Day with Helpful Tips! Yeah, I’m not a fan of spiders on the best of days, and when a big one like that gets away I’m not a happy camper. The ride was definitely worth it, thankfully the bumps were only a small portion of the whole ride. We really do rely on the internet far more than our guidebooks. I don’t know about Europe, but things change in Asia so quickly that most guidebooks that aren’t actively researched and updated are totally wrong within a year. Glad you’re enjoying our blog, thanks for reading! Great story, and great pics again! 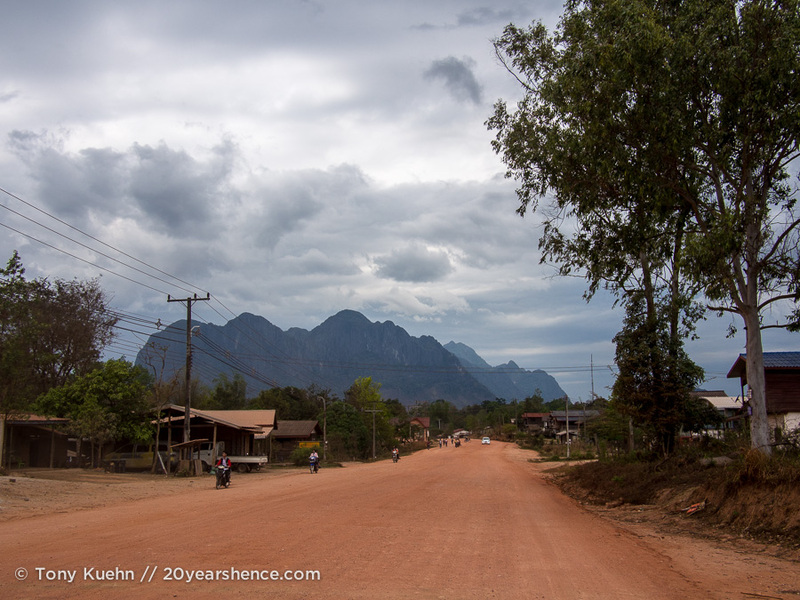 The colours in the Lak Sao pic, with the red dirt road and the brooding mountains… beautiful! Hi Jenia! Have fun on the Loop! We’ll be writing another post with all our tips and advice, but you’ll likely have left before we get it up. In case you were wondering, we rented our bikes from Wang Wang who are on the same square as where the fountain is in the center of the tourist area.